Metalworking on the Korean peninsula dates to the first millennium BC, when bronze casting was introduced. The splendours of Korean metal production include magnificent crowns, belts, headdresses and ornaments wrought from gold and jade from the 5th to 7th centuries; the bronze mirrors of the Koryo dynasty (918–1392); and the metal-inlaid bronze and ironwork of the Koryo and Choson (1392–1910) dynasties. 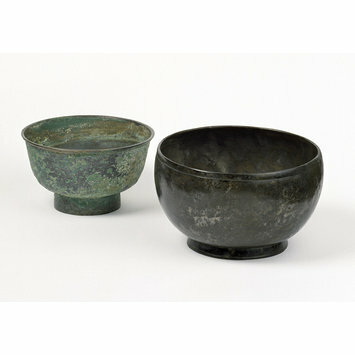 The shape of this bowl dates it to the Choson dynasty: it is similar to that of ceramics from the same period. 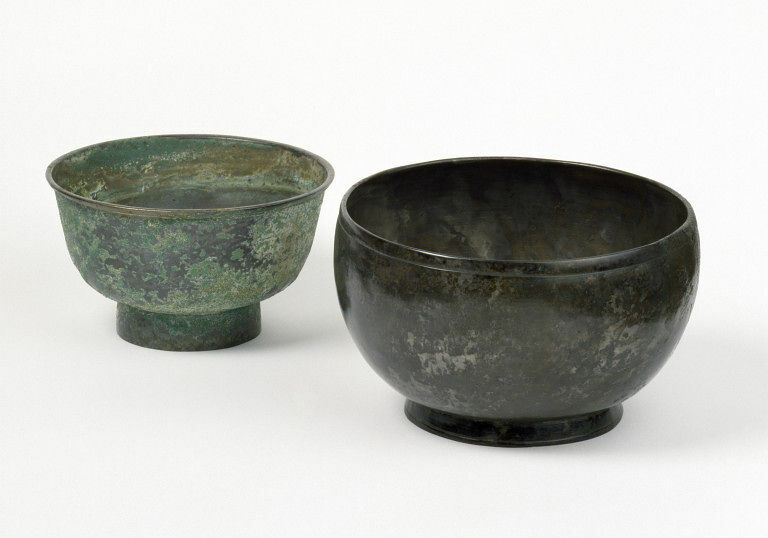 A Korean saying states that ceramics are for summer use and metal for winter and it was not uncommon for metal and ceramic versions of the same vessels to be made. Fine ring marks suggest that it was turned rather than cast. The bronze is so thin that it has disintegrated in places, leaving tiny holes in the walls. The bowl is secured to its base by four rivets. The body is semicircular, and the base is low-rimmed.The walls curve inwards, and an incised line runs below the rim.